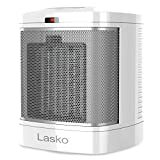 Lasko - CD08200: Space Heater • The Air Geeks, reviews of air conditioners, dehumidifiers and air purifiers. Imagine you wake up on a chilly fall or winter morning and you get ready to go to work or school. A warm shower sounds like just thing to wake you up and prepare you for the day. However, the moment you step into the bathroom, everything, especially the floor, is freezing. What do you do? Reconsider? Skip the shower today? Well, if you had invested in a bathroom space heater, your morning would have been more pleasant. We all know that turning on the main heating system isn’t the most economical way of heating up a bathroom that you are going to use for less than 30 minutes. Lasko has a solution for this! Let’s look at Lasko CD08200 ceramic heater and dig deep into its features to see if it would be the perfect candidate for our bathrooms. This heater uses a self-regulating ceramic element in order to quickly heat up the intended space. It would also be good to use in smaller rooms such as kitchens, bedrooms, and small offices. The compact design is very appealing and it will blend seamlessly with your home’s interior décor. This heater does a good job of preventing itself from overheating. There is an overheating detection switch that will automatically turn off the appliance if its temperatures exceed the safe levels. It also deploys a safety topple detection switch that switches the device off in case it is knocked over by you, a family member, or a pet. There is an ALCI safety plug to ensure safety from shocks while using the appliance in the bathroom. The heater is also ETL listed so you can expect it has the basic safety tests. Lasko CD08200 has a maximum heat output of 1500W which is more than enough to take the chill out of your bathroom. It does all this while being able to maintain a cool-to-touch exterior to prevent burns in the event someone touches it inadvertently. It is definitely going to reduce wear and tear on your main heating system and bring the cost down significantly. Its small, space-saving design enables it to be used almost anywhere, be it on the desk alongside your computer, under the desk to warm your feet, or in the bedroom beside your bed. It is 7.7 inches tall and it only weighs 3.4 pounds which facilitates easy relocation and placement on virtually any surface. It is also very easy to carry in your travel bags along with your clothes as it does not take any significant real estate. While lifting it, extra care should be taken to ensure it doesn’t slip off due to its smooth exterior. There is no handle to help ensure a firm grip but you should not have any problem if you use you both hands. The control panel doesn’t have much on it. There is a simple heat button that sets the appliance to run for one hour. The other two options are the low and high options. The simple heat timer can be useful during those chilly mornings to quickly heat up your bathroom for a quick shower or a comfortable bath. The other two settings are steadily “on” without the ability to have a timer. Almost every setting is hardcoded in this heater so you are not at liberty to choose a precise temperature like 78 degrees. This heater comes with a 3-year warranty and fully assembled so you only have to plug it on an outlet and you are ready to go. Cost: This low-cost product is durable and safe. No caster wheels: This might be a turn-off to some people who don't fancy lifting appliances, but at least its light. No oscillating feature:You will have to frequently change the appliance direction to ensure even distribution of heat. Love, LOVE, LOVE THIS HEATER!!! I Appreciate it a lot more this week because it's been in the single digit (temp outside). I'm leaving this review and buying into more of these. I first bought one last year, used it occasionally and it did well but this year, I realized it's the best heater I have. I have other tower onesan guy blows them out of the water. The tower heater will only get my room to about 66 degrees the room is about 600 sq ft. to, this little heater on setting #2 (1500W) gets the room well above 70 degrees within less than an hour. It's amazing don't know how anyone gives it a bad review." I live in a 40ft camper and bought this heater to use in my bedroom which is about 12ft x 15ft with the slide out. It will keep the entire area warm on a 40-degree night set about 1/3 of max on high setting. It's versatility heater and works tremendously well! It's also very quiet with a minimal amount of hum that emits from the heater. I've been using it for to years now." If you think keypads have gone the way of the dinosaur, this heater should save you from the hassle of digital stuff that can be a little too much. Just plug the device in, press one of the three buttons and you are ready to enjoy the warm air. You don’t have to fiddle with digital settings to heat your room. We highly recommend the Lasko CD08200 to help you enjoy those comfortable showers on chilly mornings or evenings – you will love it. It lacks some features that we have seen in many other portable heaters, but that shouldn’t be a problem since those are often superfluous to enjoying a your steamy shower.